An embossed leather feature wall I tucked into an entrance alcove to complement the ‘Old World’ design scheme. Make a statement and celebrate the art of living with a custom painted feature wall accent to personalize your home sanctuary. Feature wall concepts are a clever, quick and easy way to inject color, add mood or enhance a room without redoing the entire color scheme that exists. Give any room in your home a lift by accentuating one wall, essentially creating a feature wall, whose design differs from the other walls in the room. 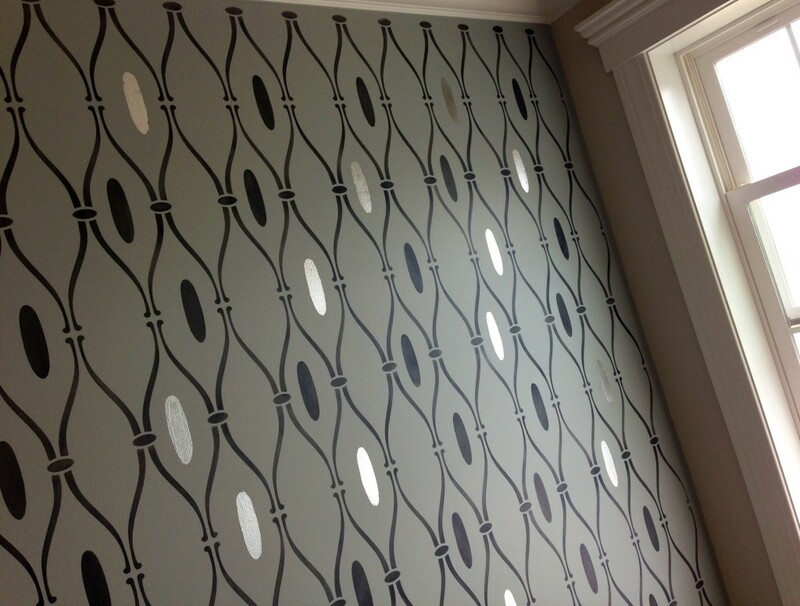 As a Decorative Artist, custom feature wall finishes are one of my favorite means to create an original, stylish reflection of a client’s personality, tastes and interests. 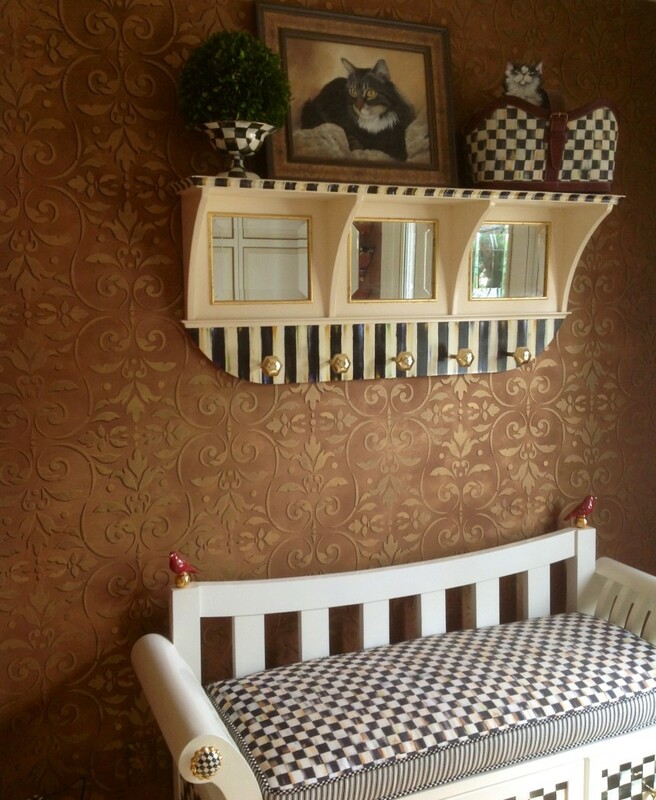 Aside from adding excitement to a room, feature wall finishes may also serve an aesthetic purpose to highlight an architectural element or frame a design nuance like artwork, a headboard, or fireplace mantle. 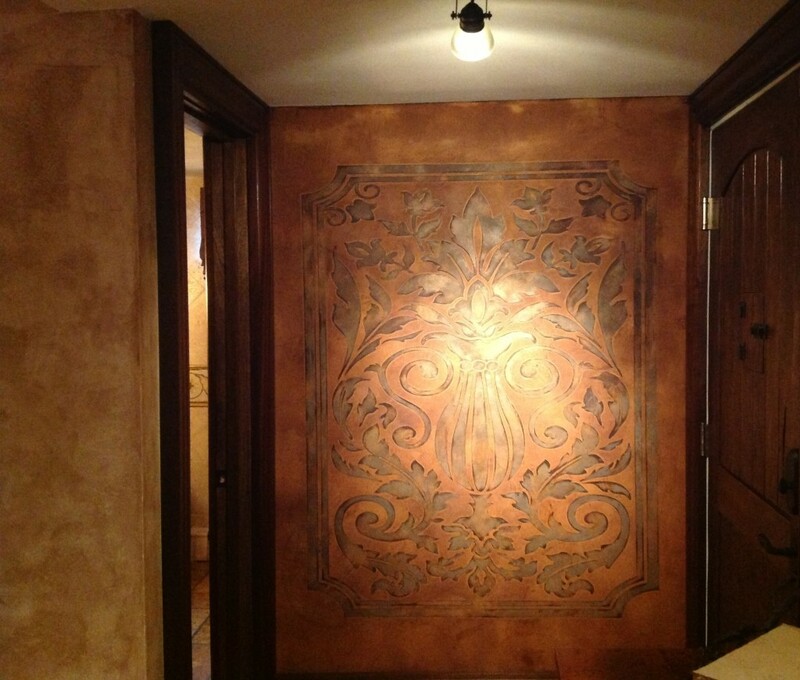 I faux finished this entire entranceway in Brown Suede Lusterstone. A niche alcove with bench seating served as a perfect place to create a feature wall with stenciled gold Pompeian ornament…highlighted by filtered light shining through the front door window. 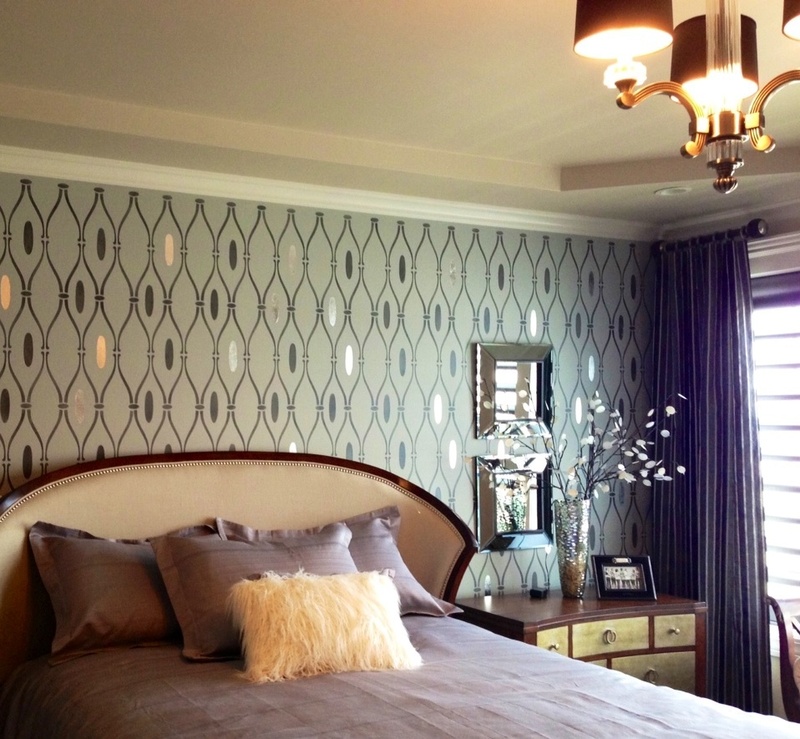 When entering a room, intuitively feel which wall facet naturally falls as a focal point. There’s always a logical reason why a wall invites special treatment and deserves attention to draw the eye. Elements to consider include balancing color and design with existing features and planned furnishings. Also, the quality of light entering the room during the day, and ambiance created by sconces, chandeliers or table lamps in the evening hours. 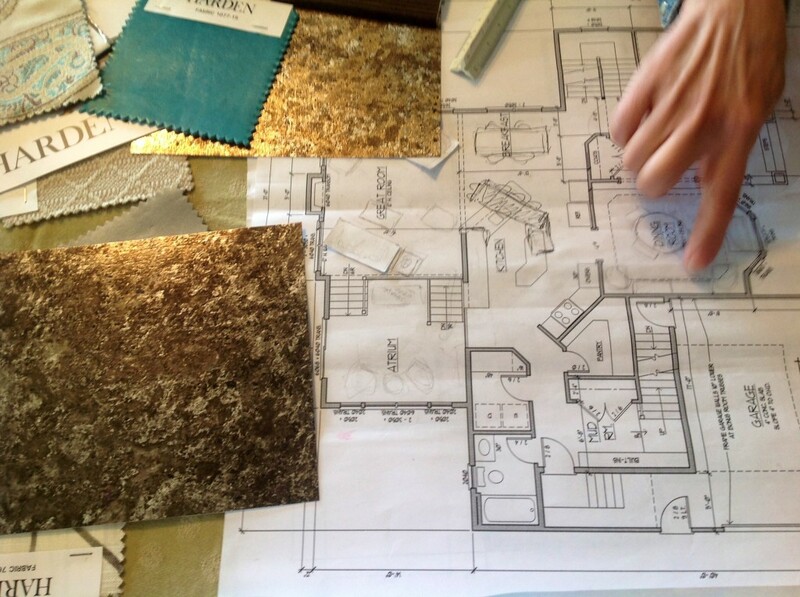 Selecting colors and faux finish treatments is always a collaborative venture with designers and clients. Creating sample boards allows me to work through the brainstorming process to determine what looks and feels right for the home and client. I put countless hours in behind the scenes…working in my studio to brainstorm different finishes, color and ornament options to create the ‘perfect’ finish for each project. Color palette may be layered in the same color-way to keep the look coordinated with tone-on-tone lighter/darker variations of a hue. Often times I’ll play off the tone-on-tone effect by leaving 3 walls flat painted in a favorite color, and create a feature wall in a similar shade but differentiated with a faux finish medium such as venetian plaster or glazed color washing. 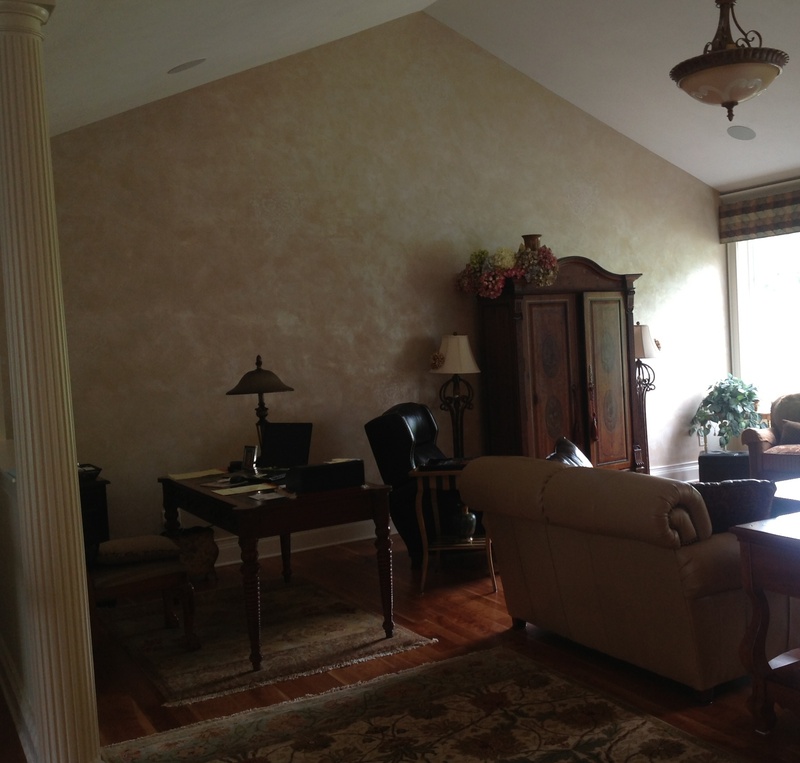 After shot of Family Room feature wall with subtle tone-on-tone Lusterstone finish – which added a layer of coziness, warmth, and interest to the room. 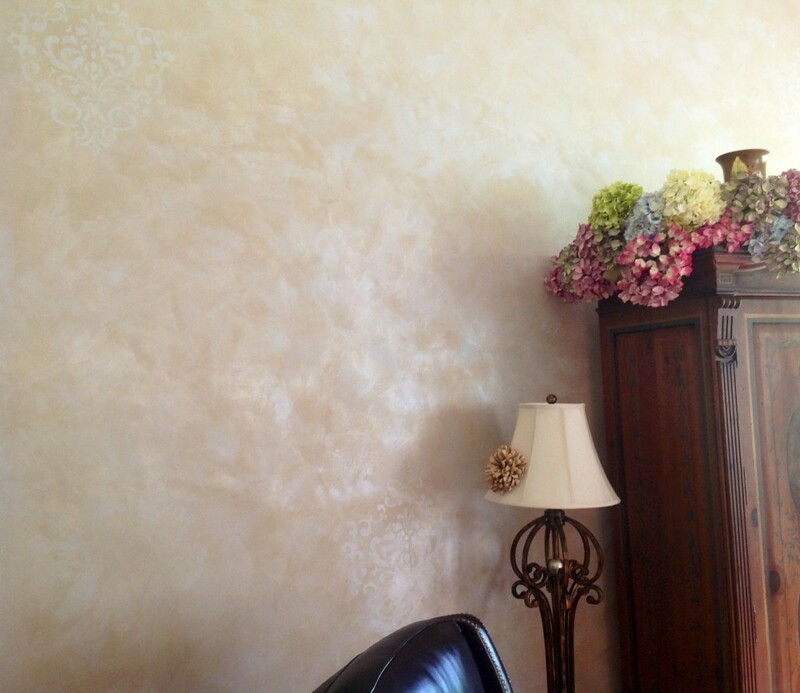 The tone-on-tone hand troweled Lusterstone feature wall was embellished with very subtle damask accents. When working in a particular color scheme – sometimes it’s fun to inject a pop of color and/or ornament that adds personality and excitement without overpowering the room. For ornamental decorative paint finishes, seeds of inspiration are often found in window treatment, pillow, and upholstered chair fabrics. A recent commission highlights the process of gleaning inspiration directly from a fabric bolt used to upholster two armchairs. 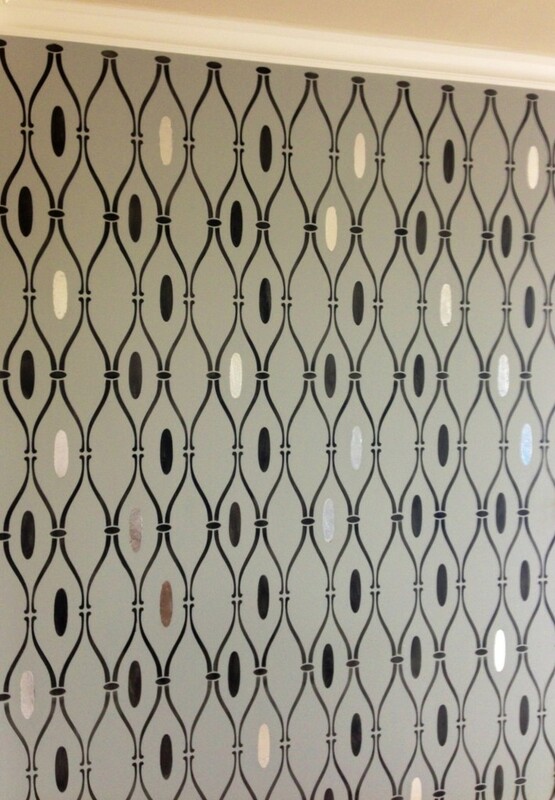 Client requested a Family Room feature wall inspired by upholstered armchair fabric. 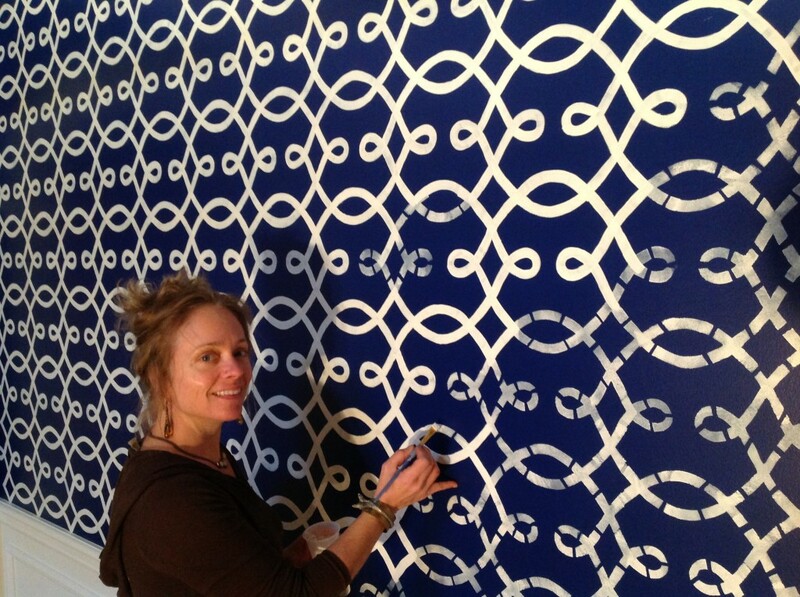 I traced the ornament on a sheet of mylar and hand-cut a template to lay the design out on a 30′ expanse of wall. 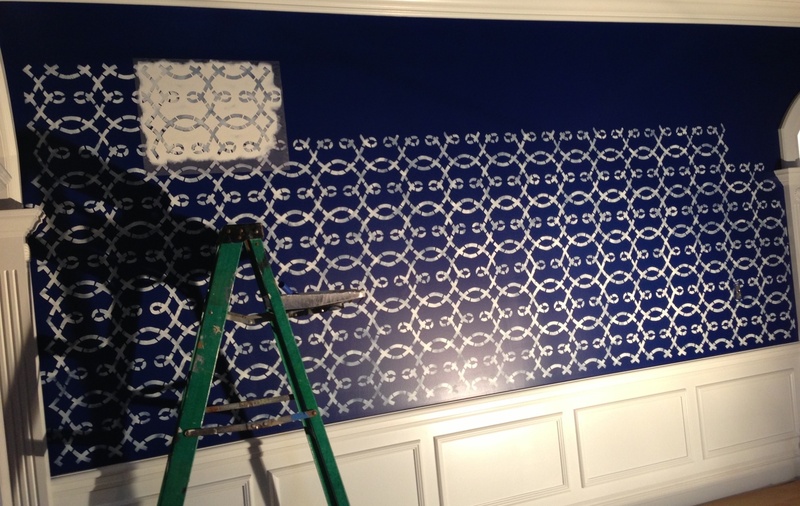 With the Family Room walls base-coated a rich shade of Behr Sailboat Blue, I began stenciling the basic layout of the ornamental fabric pattern. 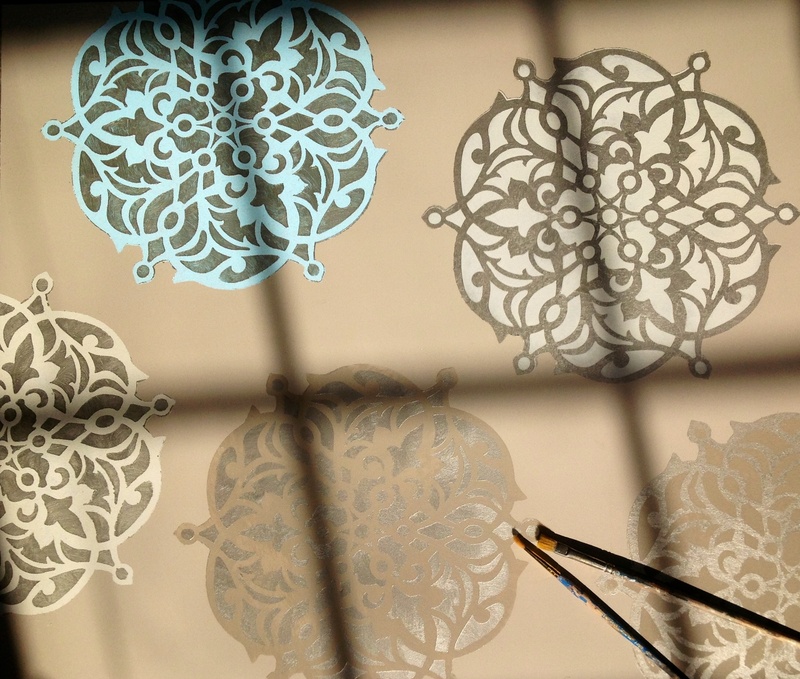 After the ornament was mapped out, I reworked the entire motif with a 1/2″ brush to richen the design with hand-wrought flare. 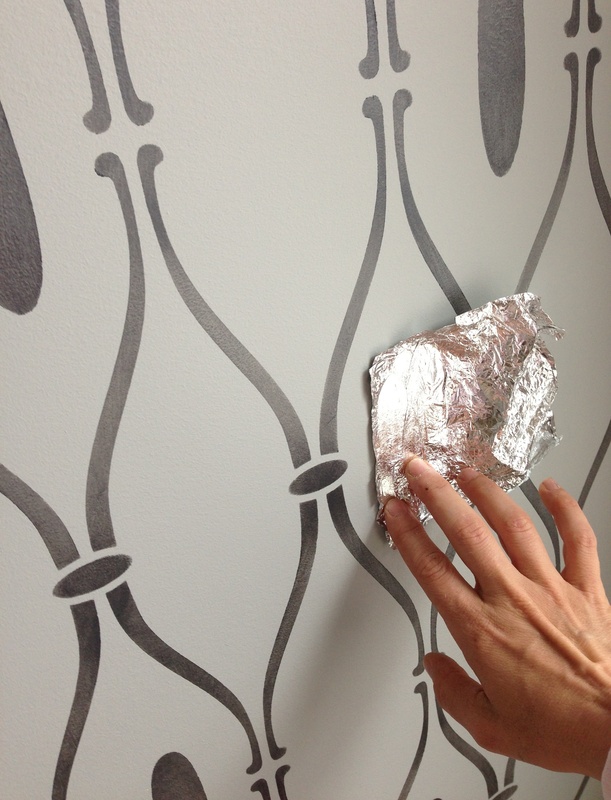 Most guests thought the finish was wallpaper at first glance. Upon closer inspection, the wall is seamless (unlike wallpaper) and the quality of painted gesture marks are apparent. 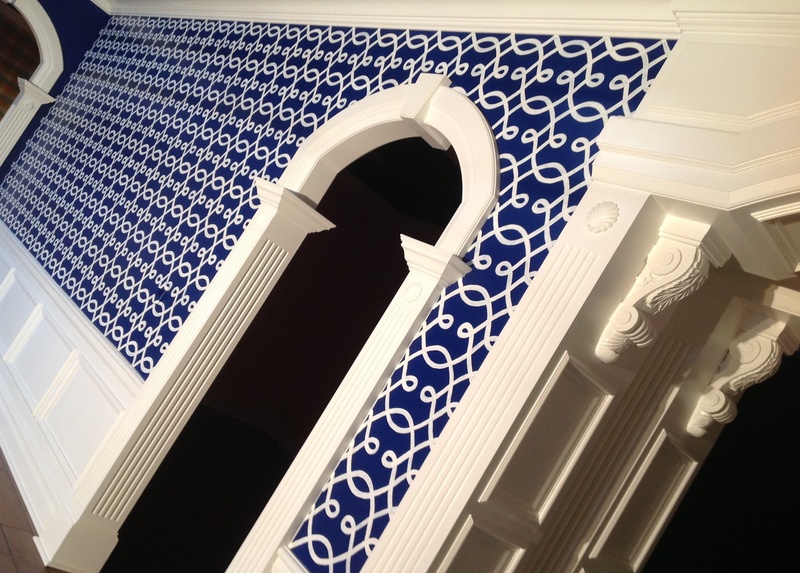 The fabric inspired ornament perfectly fit the expanse of feature wall, and was a lovely complement to the bold, elaborate woodwork. 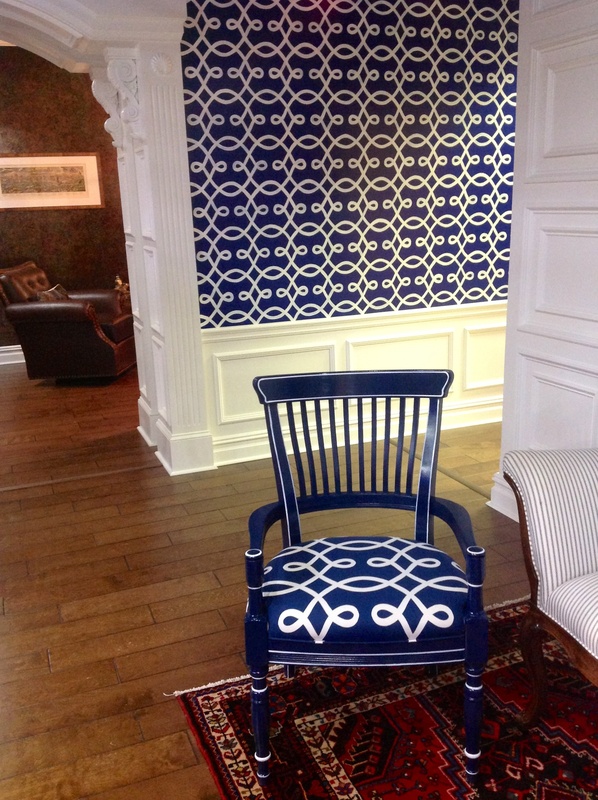 The seed of inspiration found in design accents…that tie it all together into a beautiful package. Most recently, I partnered with celebrated Interior Designer – Rene Settineri of Rene Designs to create a ‘very special’ feature wall for the 2014 Central New York Parade of Homes Tour. Rene is a lovely Muse and a delightful professional patron to work with…kind, generous, devoted, inspiring. There’s a natural fluidity, bounce back and forth to our brainstorming process and creative partnership. 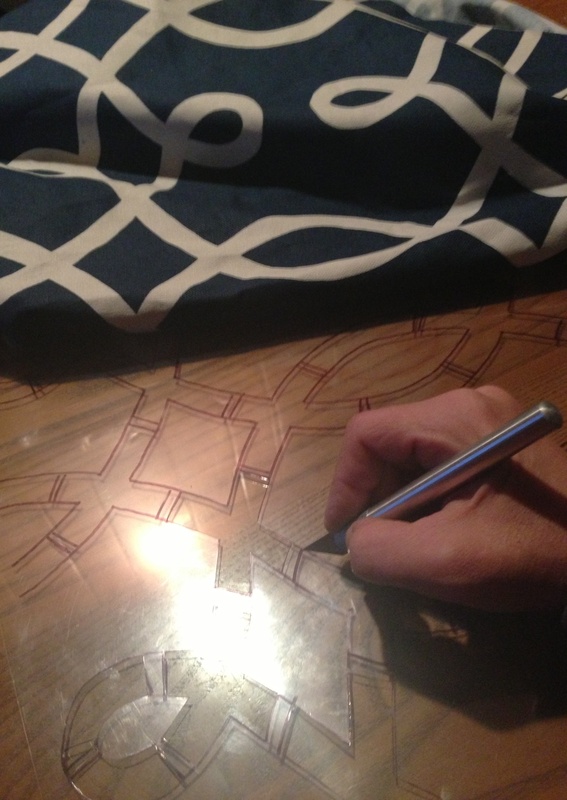 A glimpse into one of the many brainstorming and sample review sessions I had with Rene Settineri…the celebrated Interior Designer who commissioned my work for the 2014 Central New York Parade of Homes. 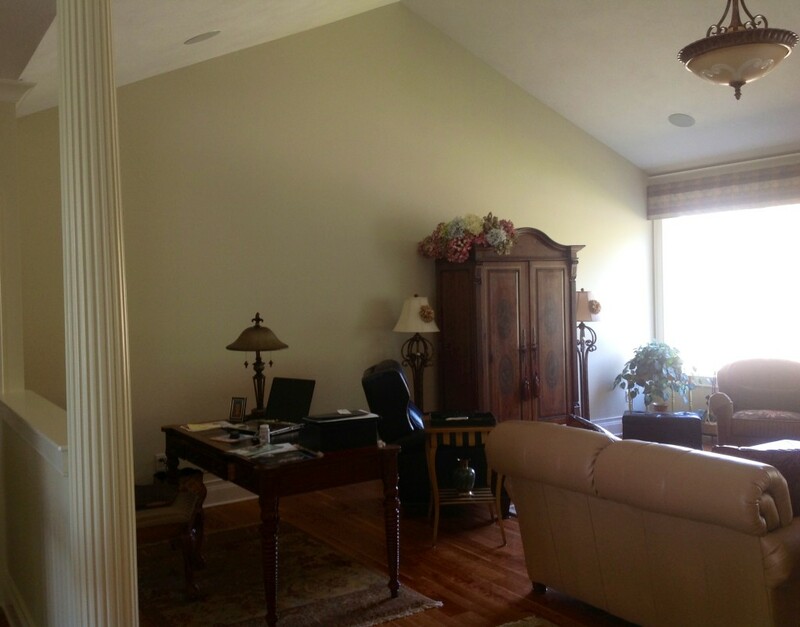 Before shot – the Master Bedroom feature wall base coated in Benjamin Moore Covington Grey. Project group portrait with yours truly, Interior Designer Rene Settineri of Rene Designs, new home owners – the lovely Lauren Marinelli and her fiancé, Ryan Geiger…a great team! The Harden bed with uber cool headboard Rene selected for the soon to be newlyweds Master Bedroom commanded a backdrop – which the feature wall concept was well suited for. Rene preferred our feature wall palette range to be in shades of soft grey, silver, and black – which coordinated with the headboard and bedding fabric design. I pulled the part of selecting ornament and the best mediums to work with to create a stellar effect – opting for the elegant glow of Ebony Frost Lusterstone with gilded silver leaf to ad visual interest, depth to the ornament, and a clever means of catching the light cast from a large window during the day and ambient chandelier in the eve. Starting the creative process…with a gentle breeze from the bedroom window swirling about the delicate silver leaf I intend to use as an eye-catcher. 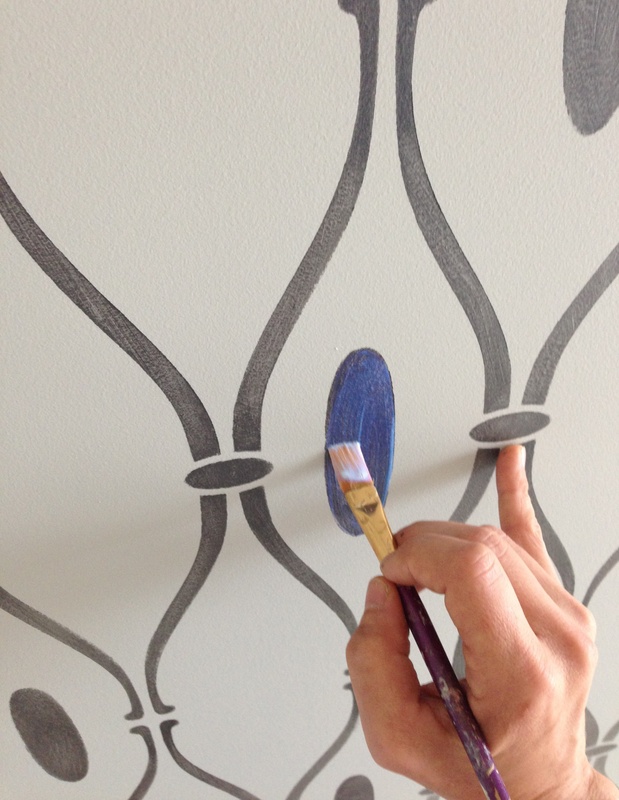 Stenciling Ebony Frost Lusterstone to layout trellis ornament across the feature wall. Applying the sizing medium, which comes to tack for the gilding process of silver leaf application. 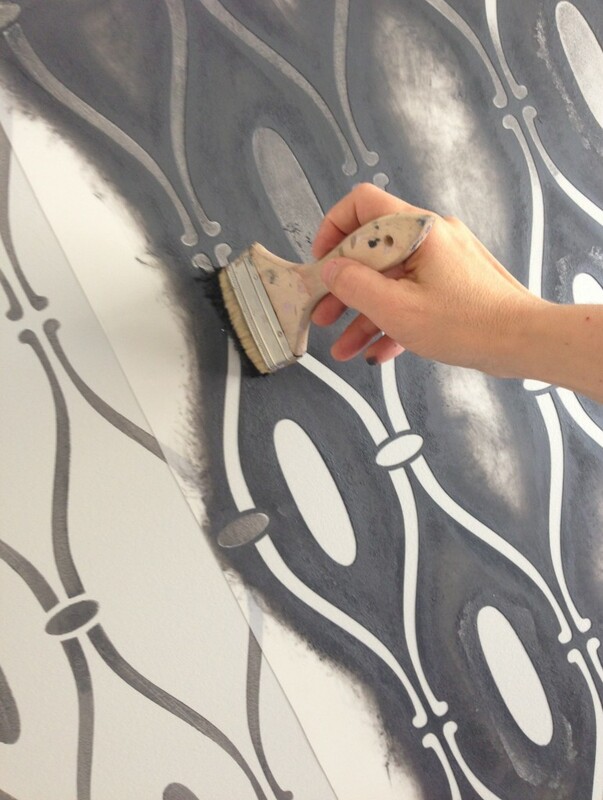 Applying the silver leaf accents in a random manner to create interest and an abstract modern art feel. 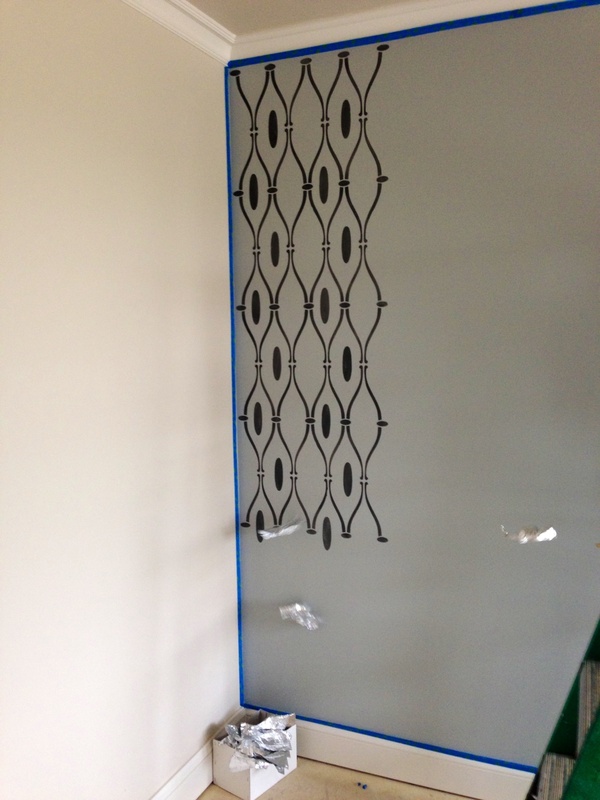 The Master Bedroom feature wall – custom painted and gilded design element upon completion. We achieved our desired effect of catching the light, adding depth and interest to the feature wall selected to frame the Harden bed in a newlyweds Master Bedroom. Our joint collaboration to create an interesting and unique feature wall with modern flare has been a huge hit with the new homeowners Ryan and Lauren, colleagues who observed our work process behind the scenes, and guests who’ve been flocking in to admire the finished, well-appointed home for inspiration. We’re geared up to host the show home, and are so thrilled to celebrating the fruits of hardwork and great teamwork. Please join us at The Farmstead in the Town of Clay, New York. The 2014 Parade of Homes Tour runs from June 7th – 22nd. Hours are Monday – Friday from 1:00pm to 8:00pm, Saturday – Sunday 11:00am to 6:00pm. Rene and I will be happy to greet you in the JMG Custom Homes ‘Genevieve’ model…hope to see you there! !